The beginning of the NBA playoffs has been nothing short of action packed. Between dominant performances by the powerhouse teams of each conference and surprising upsets, it has a little bit of something for everyone. There are many intriguing storylines to keep our eye on as the playoffs progress. The most eye-catching is certainly the early struggles of the Cleveland Cavaliers. Heading into game 4 of their series, the Indiana Pacers have surprisingly taken 2 games from the defending Eastern Conference champions. 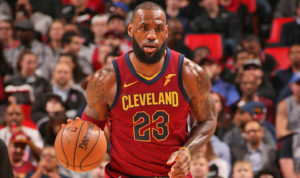 Victor Oladipo and company have come out and delivered a proverbial sucker punch to the mouth of LeBron James and his team. While King James is always dangerous, this is obviously not the ideal start to the playoffs for him. These struggles will only fuel the fire that is LeBron leaving in free agency. One possible destination for LeBron has to be the Philadelphia 76ers. After only winning 10 games two seasons ago, the Sixers, led by Joel Embiid and rookie of the year favorite Ben Simmons, went on to win 52 games this season and capture the Eastern Conference three seed. These Sixers are not the typical “Trust the Process” teams of the past. This team is loaded and has all the tools to compete for a conference championship. Former developmental league player Robert Covington has come into his own as a force in the league and has been aided by the addition of Croatian forward Dario Saric. The Sixers have jumped out to a commanding 3-1 series lead against the Miami Heat early on in their series. The possibilities and ceiling for this team seem limitless and the young core is only getting better and developing, which is a scary thought for the future of the Eastern Conference. Out in the West, the Rockets seem to be running away with the conference. The early season addition of point guard Chris Paul seems like a god send for a team already containing perennial MVP candidate James Harden. The Paul-Harden combo, coupled with Clint Capela and Trevor Ariza has been a seemingly unstoppable force all year long. Their offense is seemingly unstoppable and no one has seemed to have an answer for it all season long. They are undoubtedly the favorites in the West and most likely the entire league. However, a team from Golden State might have something to say about this. With former MVP Stephen Curry sidelined with an injury, the defending champions have almost flown under the radar headed into these playoffs. These Warriors are not to be underestimated knowing what they are capable of. With a commanding 3-0 series lead without Curry against the Spurs, the Warriors are anxious and believe that a Curry return puts them right back in the hunt for the title. A potential Western Conference finals between the Rockets and Warriors has the entire league salivating and could be some of the highest quality basketball the league has seen in a long time. With so many question marks going into the rest of these playoffs, how can anyone decide which storyline to focus on? As a fan of the league, the best option may be to watch them all and enjoy the best players in the world displaying their skills. Senior Joe Giordano is a Senior Editor. His email is jgiorda1@fandm.edu.